Why Trust a NAMRI Mold Professional? Mold problems can pose serious health risks and can greatly devalue a property. 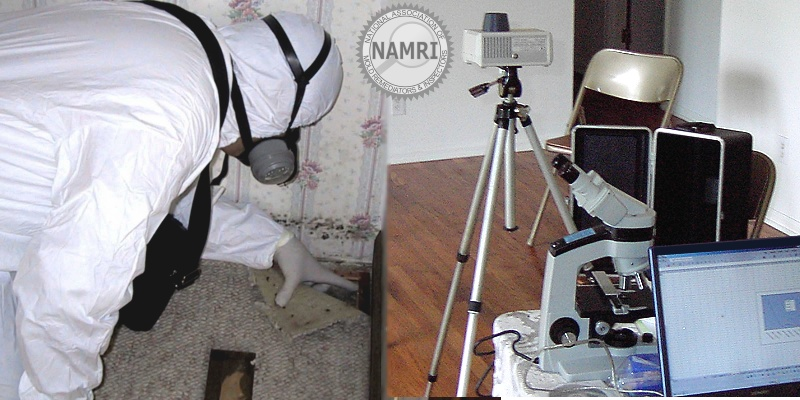 Your NAMRI inspector will identify visible areas of microbial growth, water damage, and potential problems that can affect the home. The inspector will perform a knowledgeable mold inspection, along with client-approved mold sampling using national standards of practice, providing vital information that you need to know. Your NAMRI inspector will always put your interests first, treating each inspection with honesty, integrity, and complete confidentiality. Molds are fungi of more than 100,000 species that break down organic materials in nature such as dead plants and wood. They reproduce through microscopic spores that are spread through the air. In order to grow, mold requires a source of food, moisture, and a suitable temperature. Mold can grow on any surface that is organic or has household dust or soil particles. Mold is identified through surface and air sampling which is sent to a mycology laboratory for testing. However, mold identification does not provide information about the possible exposure to mold, or the risk of health effects from mold. A certified industrial hygienist (CIH) or a certified residential mold inspector (CRMI) is qualified to inspect a home for the presence of visible mold, and to collect samples for mold. How Does Mold Affect My Home? Mold inside homes has always existed, but building flaws and cheap construction materials have amplified the problem in recent years. There is a lot of misinformation about mold in the building industry. There are those who minimize the problem, and those who exaggerate it. No one disputes the fact that certain molds can be harmful to some people. There is evidence of permanent neurological, pathological, immunological, and psychological damage that exposure to certain mycotoxin producing fungi causes. However, the affects of most molds is largely unknown. People's reaction to mold differs based on individual immune systems and exposure. Despite much research and scientific findings, the Center for Disease control (CDC) claims that at present there is no test that proves an association between the toxic black mold Stachybotrys chartarum and particular health symptoms. As a result, the government has not set any standards or exposure limits for indoor air quality. The insurance industry has reacted to mold in homes by canceling policies or refusing to issue policies that include mold due to a growing number of lawsuits. Insurance companies have paid out billions of dollars in mold claims each year. For the sake of your property value alone, it is important to understand how mold can affect your financial future. Mold Center for Environmental Health - General information from the Centers for Disease Control and Prevention. EPA Mold Resources - The Environmental Protection Agency mold information. Mold Help.org - A lot of information about mold and the potential problems caused.